Los Angeles, CA, January 16, 2018 – Today at the Television Critics Association Press Tour, PBS KIDS announced a first look at its newest animated series, PINKALICIOUS & PETERRIFIC, based on the best-selling Pinkalicious book series by author Victoria Kann. In the lead-up to its February 19 broadcast premiere, PBS KIDS is giving fans a special sneak peek on pbskids.org and the PBS KIDS Video App. Three full-length 11-minute stories are now available; additional stories will roll out on digital platforms every Friday until February 9. The series’ on-air premiere on February 19 will feature five 11-minute stories, one of which guest stars Marlo Thomas, who voices a dragon named Gertie. PINKALICIOUS & PETERRIFIC follows the adventures of Pinkalicious and her brother, Peter, as they explore the town of Pinkville with their neighborhood friends. The imaginative Pinkalicious finds creative opportunities everywhere she looks, with Peter and her friends Jasmine, Rafael and Kendra in tow. She inspires everyone around her to be creative and find imaginative solutions to problems, and expresses herself in ways that encourage children to do the same. Produced by WGBH Boston and Sixteen South Studios, PINKALICIOUS & PETERRIFIC encourages kids to engage in self-expression and the creative arts, covering areas such as music, dance, theater and visual arts. Each episode includes two 11-minute stories featuring Pinkalicious, Peter and their friends, and one live-action interstitial. The interstitials will feature real-life kids creating art, as well as profiles of professional artists. Renowned musicians such as blues recording artist Vaneese Thomas and author-illustrator Victoria Kann are among the artists featured. 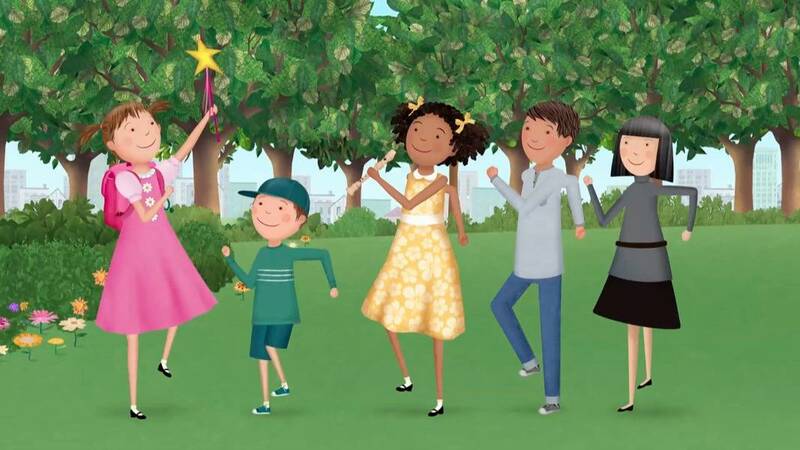 “With this new PBS KIDS series, kids can explore their own creativity and connect with the wonderful world of Pinkalicious, Peter and their friends,” said Dorothea Gillim, Executive Producer, PINKALICIOUS & PETERRIFIC, WGBH Boston. PBS KIDS and local stations across the country support the entire ecosystem in which children learn, including their teachers, parents and community. PINKALICIOUS & PETERRIFIC is part of a multiplatform media experience that will include digital content for kids, parents and teachers, beginning in February. PINKALICIOUS & PETERRIFIC will offer a variety of games at pbskids.org and on the PBS KIDS Games App, as well as clips and full episodes on pbskids.org and the PBS KIDS Video App, which is accessible on a variety of mobile devices and platforms such as Roku, Apple TV, Amazon Fire TV, Android TV and Chromecast. A PINKALICIOUS & PETERRIFIC app, Party with Pinkalicious!, a creative app experience that will support the series, will also launch in February. Parent resources will be available on the PBS KIDS for Parents website, and PBS LearningMedia will offer classroom-ready materials for teachers, including video excerpts, games, tips and printable activities. PINKALICIOUS & PETERRIFIC is based on the author-illustrator Victoria Kann’s number-one New York Times-bestselling book series, Pinkalicious which includes 63 titles and has sold more than 23 million copies to date. The HarperCollins book series has been translated into eight languages and is available in nine countries. The series also inspired a stage musical Pinkalicious: The Musical, which premiered in New York City to sold-out audiences and continues to be performed across the country. Pinkalicious & Peterrific is produced by WGBH Boston and Sixteen South Studios. Produced with the participation of Northern Ireland Screen. Funding for PINKALICIOUS & PETERRIFIC is provided by public television viewers. Corporate funding is provided by Kiddie Academy® and Homer. For more information, visit: pbskids.org/pinkalicious and follow Pinkalicious & Peterrific on Facebook, Instagram, Pinterest and Twitter. More information on PINKALICIOUS & PETERRIFIC, including when to watch, is included below. Images, episode descriptions and additional programming information are available on PBS PressRoom. Public media producer WGBH is America’s preeminent public broadcaster and the largest creator of PBS content for TV and the Web, including Masterpiece, Antiques Roadshow, Frontline, Nova, American Experience, Arthur, Pinkalicious & Peterrific and more than a dozen other primetime, lifestyle and children’s series. WGBH’s television channels include WGBH 2, WGBX 44, and the digital channels World and Create. WGBH Radio serves listeners across New England with 89.7 WGBH, Boston’s Local NPR®; 99.5 WCRB Classical Radio Boston; and WCAI, the Cape and Islands NPR® Station. WGBH also is a major source of programs for public radio (among them, PRI’s The World®), a leader in educational multimedia (including PBS LearningMedia™, providing the nation’s educators with free, curriculum-based digital content), and a pioneer in technologies and services that make media accessible to deaf, hard of hearing, blind and visually impaired audiences. WGBH has been recognized with hundreds of honors: Emmys, Peabodys, duPont-Columbia Awards and Oscars. Find more information at wgbh.org.